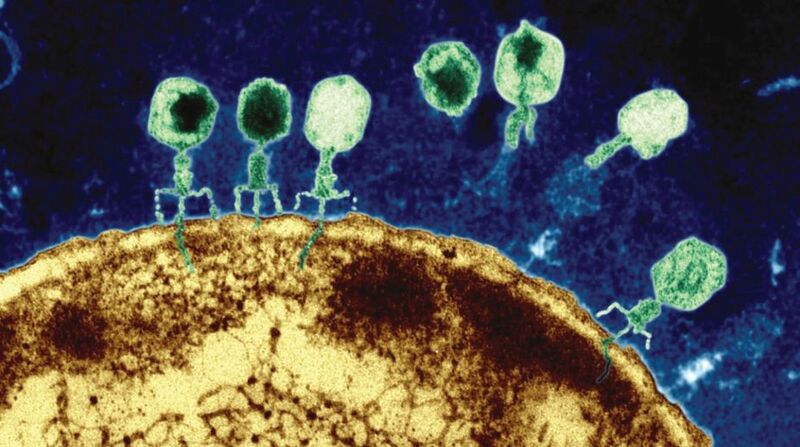 Bacteriophages are viruses that infect bacteria. They have been objects of scientific study since the 1930s, and much of our early understanding of molecular genetics came from experiments involving these viruses. One of the most thoroughly studied of the phages that infect the bacterium Escherichia coli is bacteriophage T2. During infection, this virus attaches to the bacterial cell surface and injects material into the cell. Shortly thereafter, the bacterial cell begins to produce thousands of new copies of the virus. This scenario suggests that the material injected into the bacterial cell carries the genetic information that guides the production of the virus. What is the chemical nature of the injected material? In 1952, Alfred Hershey and Martha Chase designed an experiment to address this question. Only two possibilities exist because the T2 virus is constructed from only two kinds of molecules — DNA and protein. To distinguish between these two alternatives, Hershey and Chase took advantage of the fact that the proteins of the T2 virus, like most proteins, contain the element sulphur (in the amino acids methionine and cysteine) but not phosphorus while the viral DNA contains phosphorus (in its sugar-phosphate backbone) but not sulphur. Hershey and Chase therefore prepared two batches of T2 phage particles (as intact phages are called) with different kinds of radioactive labelling. In one batch, the phage proteins were labelled with the radioactive isotope 35S; in the other batch, the phage DNA was labelled with the isotope 32P. By using radioactive isotopes in this way, Hershey and Chase were able to trace the fates of both protein and DNA during the infection process. They began the experiment by mixing radioactive phage with intact bacterial cells and allowing the phage particles to attach to the bacterial cell surface and inject their genetic material into the cells. At this point, Hershey and Chase found that the empty protein coats (or phage “ghosts”) could be effectively removed from the surface of the bacterial cells by agitating the suspension in an ordinary kitchen blender and recovering the bacterial cells by centrifugation. They then measured the radioactivity in the supernatant liquid and in the pellet of bacteria at the bottom of the tube. The data revealed that most (65 per cent) of the 32P remained with the bacterial cells, while the bulk (80 per cent) of the 35S was released into the surrounding medium. Since the 32P labelled the viral DNA and the 35S labelled the viral protein, Hershey and Chase concluded that DNA, not protein, had been injected into the bacterial cells and hence must function as the genetic material of phage T2. This conclusion received further support from the following observation — when the infected, radioactive bacteria were resuspended in fresh liquid and incubated longer, the 32P was transferred to some of the offspring phage particles, but the 35S was not. Why did the Hershey-Chase experiments receive a warmer welcome than Avery’s earlier work on bacterial transformation, even though both led to the same conclusion? The main reason seems to have been simply the passage of time and the accumulation of additional, circumstantial evidence after Avery’s 1944 publication. Perhaps most important was evidence that DNA is indeed variable enough in structure to serve as the genetic material. This evidence came from studies of DNA base composition. Despite the lukewarm reaction initially received by Avery’s work, it was an important influence on several other scientists. Among them was Chargaff, who was interested in the base composition of DNA. Between 1944 and 1952, Chargaff used chromatographic methods to separate and quantify the relative amounts of the four bases — adenine (A), guanine (G), cytosine (C), and thymine (T) — found in DNA. Several important discoveries came from his analyses. First, he showed that DNA isolated from different cells of a given species have the same percentage of each of the four bases, and that this percentage does not vary with individual, tissue, age, nutritional state or environment. This is exactly what would be expected of the chemical substance that stores genetic information because the cells of a given species would be expected to have similar genetic information. However, Chargaff did find that DNA base composition varies from species to species. Comparison of such data revealed to Chargaff that DNA preparations from closely related species have similar base compositions, whereas those from very different species tend to exhibit quite different base compositions. Again, this is what would be expected of a molecule that stores genetic information. But Chargaff’s most striking observation was his discovery that for all DNA samples examined, the number of adenines is equal to the number of thymines (A=T), and the number of guanines is equal to the number of cytosines (G = C). This meant that the number of purines is equal to the number of pyrimidines (A + G = C + T). The significance of these equivalencies, known as Chargaff’s rules, was an enigma and remained so until the double-helical model of DNA was established by Watson and Crick in 1953.